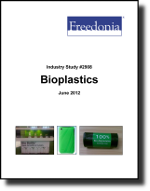 US demand for biodegradable and non-biodegradable bio-based resins is forecast to climb at a 20 percent annual pace through 2016 to 550 million pounds. Polylactic acid will remain the largest bioplastic segment, while bio-based polyethylene and degradable polyesters will grow the fastest at double-digit rates. Nonpackaging markets will outpace packaging uses.